Here is a bit of good news, for a change. It has been almost three years since there has been a case of polio in India. Once India has been confirmed to be polio free for three years, the disease will be considered eradicated in India. I read this story in the Times of India. India marked three years since its last reported polio case Monday, meaning it will soon be certified as having defeated the ancient scourge in a huge advance for global eradication efforts. India’s polio programme is one of the country’s biggest public health success stories, achieving something once thought impossible thanks to a massive and sustained vaccination programme. “We have completed a full three years without a single polio case and I’m sure that in the future there won’t be any polio cases,” Azad told reporters in the capital. With the number of cases in decline in Nigeria and Afghanistan, two of only three countries where polio is still endemic, world efforts to consign the crippling virus to history are making steady progress. “In 2012, there were the fewest numbers of cases in endemic countries as ever before. So far in 2013 (records are still being checked), there were even less,” Hamid Jafari, global polio expert at the World Health Organization, told AFP. This is wonderful news. It is too bad that India’s neighbor Pakistan does not share India’s good fortune. A fake vaccination programme was used by the CIA to provide cover for operatives tracking al-Qaida chief Osama Bin Laden, who was killed in Pakistan by US special forces in May 2011. It is unfortunate that the CIA decided to use that particular cover for its operatives, although I understand that the Taliban believes vaccination to be un-Islamic and would probably be killing vaccinators anyway. 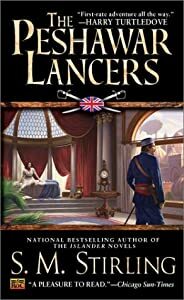 In The Peshawar Lancers S. M.Stirling writes an exciting adventure story set in an alternate history in which a comet strikes the Earth in the year 1878. The impact and the ensuing severe cooling of the climate caused by the dust and water vapor thrust into the atmosphere causes the death by starvation of most of the inhabitants of the Northern hemisphere and the collapse of civilization. By the year of the story, 2025, the world has almost reached the level of technology it possessed before the Fall. The British Empire has survived, based around its former colonial possessions, especially India. The Empire has even recolonized the British Isles. The French established themselves in Algeria and the Japanese have conquered China. The Russians have also survived after turning to Devil worship and sacred cannibalism of their subject peoples. The rest of Europe and most of North America is still inhabited by savage cannibals. In this world, Athelstane King is a captain of the Peshawar Lancers. Along with his aide, the Sikh Narayan Singh, his sister Cassandra, a mysterious Russian seeress Yasmini, and the Royal Family, King finds himself trying to foil a Russian conspiracy against his family with the fate of the Empire, and the survival of humanity at stake. The Peshawar Lancers is, as I have said, an exciting adventure story, a little like Kipling’s best. S. M. Sterling presents an immensely imaginative background for the adventure with the details that makes the society come to life. The characters are, perhaps, somewhat two-dimensional with the villain, the Russian Ignatieff, being really, villainous, but they are likeable and their actions and motives are realistic. The plot moves along nicely with the right amount of suspense and action. I thoroughly enjoyed reading the Peshawar Lancers and I hope the author might be persuaded to write more stories set in that world.